UDM Downloads > progeCAD Professional 2011 DWG CAD! AutoCAD 2011 and AutoCAD LT 2010 compatible CAD software you can afford, now Windows 7 compatible - Try for free. progeCAD 2011 is low cost enhanced version of IntelliCAD design software for editing Autodesk AutoCAD DWG files offering a similar interface. NOW SUPPORTS WINDOWS 7 64 bit. CAD design drawing and detailing software for industrial design, architectural drawing, building kitchen and bath planning, civil engineering, electrical drawing, AEC, MEP and structural engineers, road, site and town planning etc. 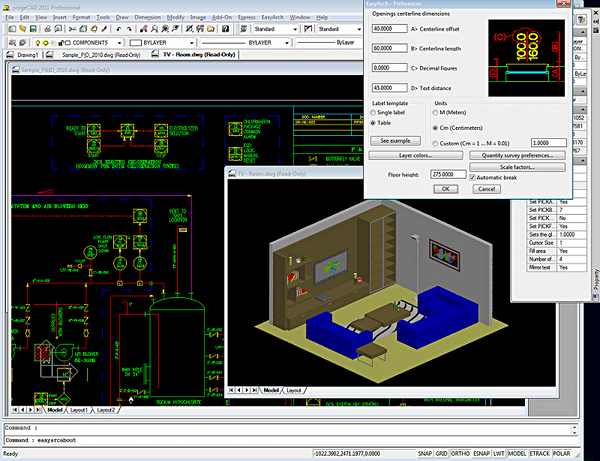 2D and 3D CAD drawing using common AutoCAD and AutoCAD LT commands including print view layout, one-click text editing and similar context menus. AutoCAD LT full DWG 2010 & DXF native editing - read & write support without conversion. Raster image editing, advanced 3D shading and rendering, quick dimension tool, raster-image-to-vector converter and more. DWF, SVG, O2C and Google Earth KML export, IntelliCAD AutoLISP, VBA & DIESEL, ACIS 3D Solids modelling, temporary point snap (oSnap), layers, blocks. Enhanced block data extraction, gradient boundary hatch and xref editing. progeCAD Professional includes 11000+ AutoCAD blocks and CAD symbols library manager free. Special upgrade promotion from IntelliCAD, AutoCAD LT, MicroStation, VectorWorks, ArchiCAD, TurboCAD Pro, Chief Architect, ZwCAD, BricsCAD Vectorworks and other CAD versions. Easy to learn. progeCAD professional includes Express-Tools, Architectural software add-on, Free technical support in Australia, Europe, Worldwide by progeSOFT and CADDIT.net ( http://www.caddit.net/intellicad/intellicad.php ). Full international commercial license suited for business use. Building designers can also try CADDIT progePLAN/CADprofi for HVAC, duct, electrical, cabling, mechanical, structural and advanced architectural detailing design and markup software for faster and more accurate drawing. CP-System is an add-on or plug-in design program for progeCAD, AutoCAD LT, BricsCAD and other IntelliCAD products.